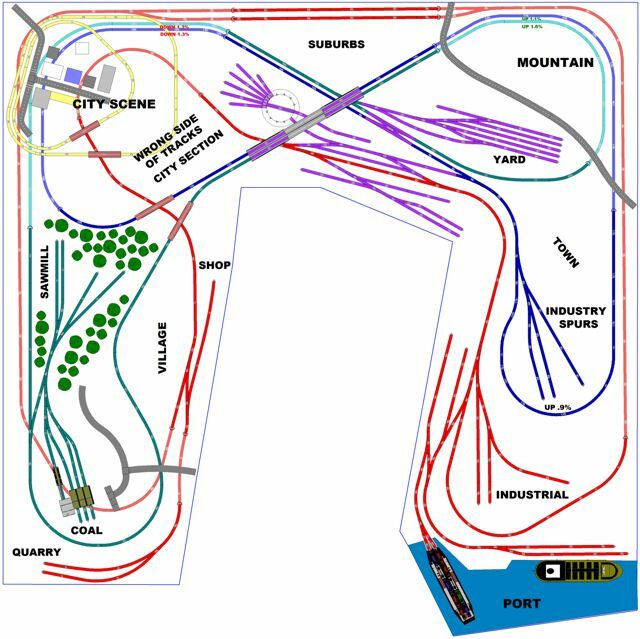 Large U-shaped train layout with 3 main lines, for servicing a city, town, village, several industries and even a port with 2-spur train ferry. "I done a preliminary layout for my attic space of 14'W X 12'D on the SCARM program. The layout is basically a 3 Railroad Lines with convergence in a common yard. It is mostly train watching, but with sidings/yard added will have switching capability. I labeled what sections envisioned for the completion. The plan size itself is 12"W X 11'D. Max grade is 2%, Min radius 12.4", clearance bridges/tunnels 2". And though the plan has a lot of KATO track, most will be built as much flex track after I run out of the KATO track I do own." More about this project as well as design changes and future build progress can be seen on Lend33 topic Feedback on this N Scale Layout on modeltrainforum.com.